The recalcitrant judges think that words can mean whatever they want them to mean. They think like Humpty Dumpty who says that it depends on who has the power – “the question is,” said Humpty Dumpty, “which is to be master”. These Humpty Dumpty judges also think that they are independent of the legislature. They think they could ignore the federal and the Perak constitutions, even the statutes enacted by Parliament so long as they side with the government in power. By so doing, these judges have exposed themselves to the rest of us because they have refused to perform their duty which is to do justice according to law. It is their duty to do the right thing. The right thing to do is to deal out impartial justice and to apply the law of the land as it stands. The notion of separation of powers or the independence of the judges seems to be beyond the comprehension of these judges. But we are here today to explain to the ordinary people of this country what it means to have an independent judiciary. Once the ordinary people have a grasp of the concept of separation between executive and judicial powers they will be able to judge the judges. When it comes to explaining the law so that it could be easily understood, I believe the late Lord Denning had no equal. In ‘The Family Story’, at pages 191,192, he explains the concept: The independence of the judges. “The keystone of the rule of law in England (and elsewhere) has been the independence of the judges. It is the only respect in which we make any real separation of powers. There is here no rigid separation between the legislative and the executive powers, because the ministers, who exercise the executive power, also direct a great deal of the legislative power of Parliament. But the judicial power is truly separate. The judges [in England] for nearly 300 years have been absolutely independent. And when I speak of judges, I include not only the High Court Judges, but also all the magistrates and others who exercise judicial functions. No member of the government, no member of Parliament, and no official of any government department, has any right whatever to direct or to influence or to interfere with the decisions of any of the judges. It is the sure knowledge of this that gives the people their confidence in the judges, and I would add also the chairmen of tribunals when they are independent of the executive, for they too are judges. It does not depend on the name judge or chairman but on the substance. The critical test which they must pass if they are to receive the confidence of the people is that they must be independent of the executive”. “It lies, I believe, first, in the instinct for justice which leads us to believe that right, and not might, is the true basis of society; and secondly, in the instinct for liberty, which leads us to believe that free-will, and not force, is the true basis of government. These instincts for justice and liberty are abstract ideas which are common to all freedom-loving countries: but the peculiar genius of the British Constitution lies in a third instinct, which is a practical instinct leading us to balance rights with duties, and powers with safeguards, so that neither rights nor powers shall be exceeded or abused. But who are the guardians of this spirit? Who are they who interpret it on our behalf? They are twofold. On the one hand – Parliament. On the other hand – the Judges. Our (the British) Constitution is unwritten. But it is founded on two strong pillars. One is the sovereignty of Parliament. The other is the independence of the Judges. In an unwritten one like the British constitution they have no entrenched clauses. They have no fundamental constitution by which other laws can be tested. They will have to rely on the common law as laid down by the judges of England. In this respect the common law of England is wove into the fabric of the history of England. But we are here today to look at the independence of the judges. This will take us back to the opening paragraphs of this address where I read from Lord Denning. Shortly stated, the independence of the judges means that there is a rigid separation of powers between executive power and judicial power. The critical test which every judge must pass is that he must be independent of the executive. If a judge does not appear to be independent of the executive then he will lose the confidence of the people. Once the people has no confidence in a judge that is the end of his reputation and integrity as a judge. Haven’t you heard the often repeated remark, ‘I don’t respect our judges any more’ among the people of this country, ever since the Perak debacle exploded onto the local scene? We, Malaysians, also feel very strongly about this. But it is not born in us. It is not in our bones that it will not do for us to allow the executive to have any control over the judges because our forefathers did not experience any bitter struggle with our rulers – our sultans and governors. Ours is a new nation; it is only 52 years old. But we have inherited the Common Law of England – see the Civil Law Act 1956 – and from the common law we have learnt how the separation between executive power and judicial power came to light. It is this awareness of the true meaning of justice that the common man can judge the judges. Anyone can be a judge. All that you need to be one is to be fair-minded yourself and to show by your conduct and behaviour in a court of law that you deal out impartial justice – for justice must not only be done, it must be seen to be done. The other attribute of a judge is to administer justice according to law. Shortly stated, justice means that the judge’s duty is to do the right thing. The right thing to do is to deal out impartial justice. The right thing to do is also to apply the law as it stands. The so-called Perak crisis has brought out a host of cases that showed that the judges gave the impression that they were one-sided. The perception of the people is that they sided with the BN government. A classic example is the shocking case of Zambry v Sivakumar in the Federal Court. We all remember the infamous five (judges) who were Alauddin Mohd Sheriff , Arifin Zakaria, Nik Hashim Ab Rahman, Augustine Paul and Ahmad Makinnuddin. They decided in favour of the BN-appointed Mentri Besar Zambry Abd Kadir. They held that the speaker of the Perak legislative assembly V Sivakumar has no power to suspend Zambry and six executive council members from attending the assembly. “This is a perverse decision of the Federal Court. It is perverse because it is a decision that was made in blatant defiance of Article 72(1) of the federal constitution that says ‘The validity of any proceedings in the Legislative Assembly of any State shall not be questioned in any court’. The judges of the Federal Court have failed the people and the government of this country when they chose to ignore the law of the constitution of Malaysia. In other words the judges have refused to do justice according to law. “The Houses of Parliament enjoy certain privileges. One of them is freedom of speech. Erskine May says: ‘What is said or done within the walls of Parliament cannot be enquired into in a court of law”. “On February 8, 1957 Mr Strauss MP wrote a letter – on House of Commons paper – to Mr Maudling, the Paymaster-General. He complained of the behaviour of the London Electricity Board. He said that they were disposing of scrap cables at too low a price. He said their conduct was a scandal. Mr Maudling … passed the complaints on to the London Electricity Board. On March 4,1957 the Board’s solicitor wrote to Mr Strauss threatening a writ. That simple solicitor’s letter raised the great constitutional issue. Who was supreme? Parliament or the courts of law? Mr Strauss said the letter (threatening a writ) was a breach of the privileges of Parliament, and that the Board and its solicitor were punishable by the House itself. The London Electricity Board said that they were entitled to have recourse to the courts of law and that the House of Commons could not stop them. Lord Denning’s dissent was that every Englishman had a right to seek redress in the courts of law and then Mr Strauss in his defence could plead the defence of Parliamentary privilege as being a ‘proceeding in Parliament’ within the Bill of Rights. You will not find his dissent in the opinion of the Privy Council – in those days dissenting opinions were not allowed. 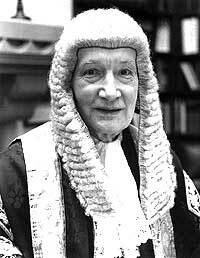 In a sense Lord Denning was right; no one could be prevented from seeking redress in a court of law. But in the case in question the issue was referred to the Privy Council for its opinion. This had preempted the writ action. Had the issue to be decided by a court of law, parliamentary privilege is still a complete defence. Now that you have been apprised of the law, you will know that there is a rigid separation of powers between the executive government and the judiciary. You will also know the true meaning of the independence of the judges. You are also sure that the separation between executive power and judicial power is real. It is not a myth. It is the law of this country. It is only those judges who had made all those decisions on the Perak crisis who have created the confusion by refusing to apply the law of the land as it stands. But to the good judges and the dedicated lawyers and to all right thinking people of this country, I urge all of you not to give up the struggle. Keep on commenting on their conduct in court. Keep on writing articles about their decisions that do not apply the law of the land as it stands. Educate the people of their rights and the law that is applicable to the decision, and should the judges divert it or depart from it – and do so knowingly – they themselves would be guilty of a misuse of power: see Lord Denning’s ‘What Next in the Law’, page 319. On my part, I shall try to ensure that the names of the bad guys will remain in infamy for generations to come unless they recant the wrongs that they have done to the country and to the people. I shall write their obituary when they die. If they outlive me I am sure there will be others who will take my place. *NH CHAN was admitted to the Bar in 1961 and was a lawyer for almost two decades before becoming a High Court judge. He was then elevated to the Court of Appeal before retiring in 2000. He is the author of two books, ‘Judging the Judges’ (2007) and ‘How to Judge the Judges’.